OK, we all see ‘em, but how much do we know about these creatures? They come looming out of the reeds with a prehistoric whirr and yet some are the brightest jewels to be seen over water, outclassing even the Kingfisher. Well, the news is, dragonflies are coming out of the closet. Twitchers have discovered them and the same people who abandon their offices the moment Birdline pages them with the news that a rare Siberian twin-cam chitchat has crash landed at an obscure map reference are doing the same with insects. Having read this wonderful book, I can understand why people get so interested in the Odonata, and I am trying to suppress the urge to buy a bleep myself. 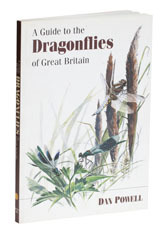 Pictures of each damsel or dragon are splashed across two pages, so that it is easy to spot the identifying features of each species, which is just as well, because there are dozens of species in the UK and Ireland. The illustrations are absolutely beautiful, drawn at a size and level of detail that I only wish bird guides would stretch to. An absolute must for the contemplative angler.